2014 ended with a fantastic two-week trip a deux to Paris followed by my sisters’ visit over the Christmas and New Year holidays. 2015 started out busy with dinner parties, getting the kids back to school and the the recent Chinese New Year celebrations and just like that, March is almost here. 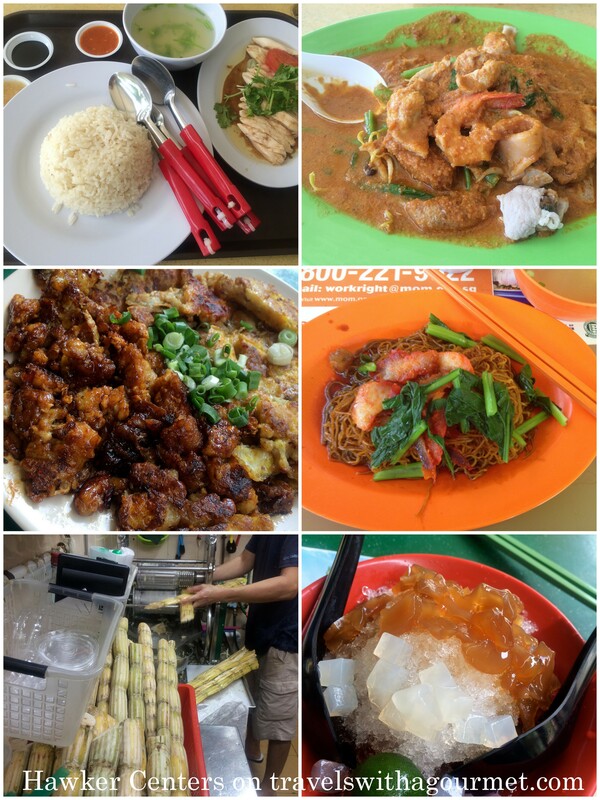 I wanted to get back to posting and I just couldn’t write about another restaurant and ignore one of the best reasons for a foodie to love living in Singapore – hawker centers – that unique outdoor food court that locals love and frequent every day. I’ve been to several over the years but it was only when we moved here that I was taken to several hawker centers by my friend D (you know who you are) who loves good food and good deal as much as I do. We meet up about once a month to try out new places or hang out at food centers and do an afternoon of hawker-hopping . Our first trip was to the Zion Riverside Food Center (70 Zion Road), we tried the black carrot cake, which is actually not made with any carrot but with radish, wok-fried then tossed in dark soy sauce and also shared an ice jelly dessert. At another hawker center near Holland Village, we had the wanton mee topped with char siew (roast pork), wilted greens and a few wantons with a plate of the classic chicken rice along with a fresh-pressed sugarcane and lemon juice. 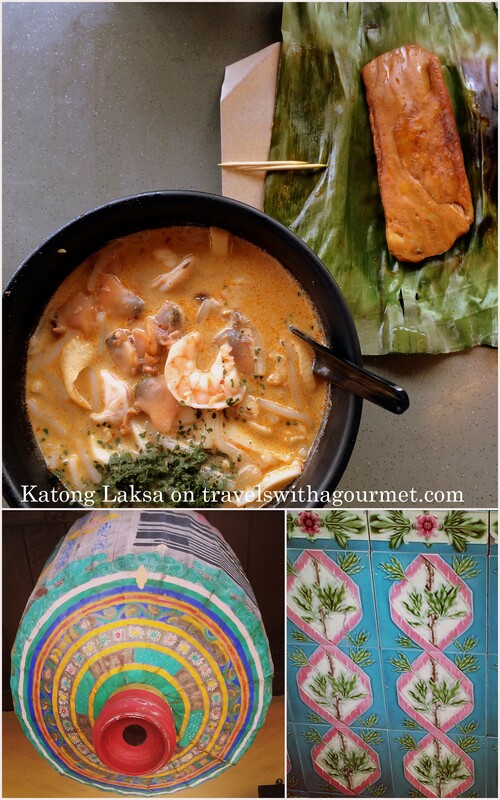 Another time, we met up at the East Coast Lagoon Food Village (1220 East Coast Parkway, Bedok) before going to the famous 328 Katong Laksa for spoon laksa (where the noodles are cut short so you can it just with a spoon) – a large bowl of sinus-clearing prawn broth and coconut milk filled with rice noodles, cockles and prawns and served with a side order of banana-leaf wrapped otak-otak (ground fish meat mixed with tapioca and spices, wrapped in a banana leaf and grilled) was a great lunch. This was followed by another short drive to the Old Airport Road Food Center – a few blocks of hawker stalls in three separate buildings. There we had a delicious mutton soup (a first for me) – clear broth with fresh herbs and mutton ribs from Hougang Jin Jia Mutton Soup (1-23) and the best bang for the buck I have ever had at a food court – the $5 fresh prawn noodle soup from Kallang Cantonese Prawn Noodle (1-83) – where the auntie fishes out three large live prawns from an aquarium and drops them into the piping hot prawn broth along with some noodles, fresh herbs and topped with chunks of crispy pork lard which melts into the broth. I would drive all the way there just for that delicious bowl of soup. We finished our meal with some banana and jackfruit fritters along with a green fruit juice, the name of which escapes me at the moment. 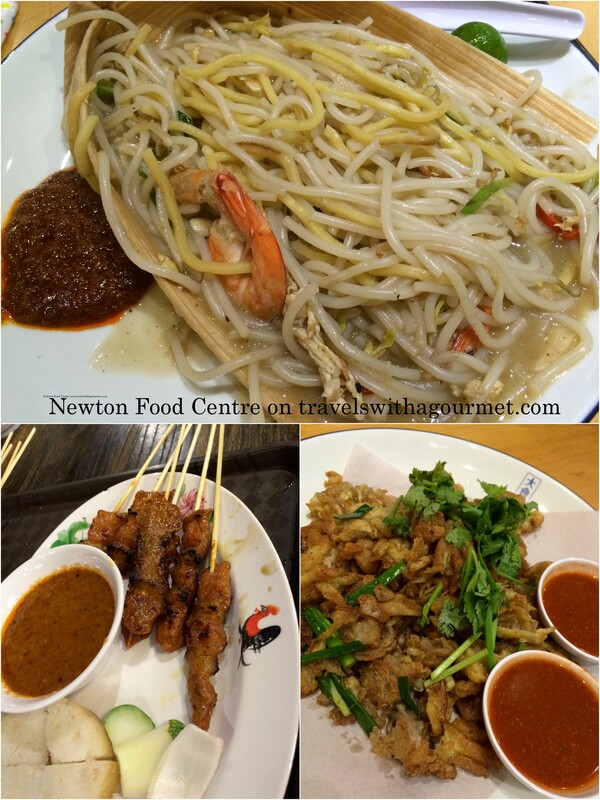 Of course, our family favorite, Newton Hawker Center which we consider our “local”, even if we live in Sentosa, is where we usually go when we just want a quick meal and can’t be bothered to cook. Many say that Newton is a rip-off and that it’s expensive and tourist-filled but we still enjoy going there and eating at our preferred stalls – perfectly crispy gooey oyster omelets from Hup Kee, grilled pork satay from the uncle at the far end near the washrooms (I don’t even know what his stall is called), hokkien mee – slightly soupy stir-fried yellow and white noodles with prawns, chili and herbs, hot and buttery roti prata to be dipped in the curry sauce or just eaten as is or fluffy garlic or butter naan with grilled prawns and crispy baby squid sotong goreng in the sticky sweet sauce. Singapore’s hawker centers are a great way to experience the local culture through food and even if I’ve been here for over a year now, I haven’t even scratched the surface. Thank goodness there’s lots more to try and loads of new places to eat in. Here’s to more hawker-hopping with family and friends!